Do Kerala needs eco-tourism ? I have lived in Alappuzha since the day I was born. There was practically no tourism here till about the 1990s, when things started to change quickly. 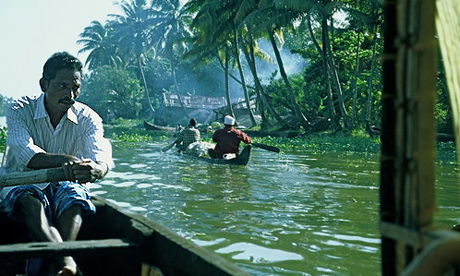 The backwaters became the hot spot for Kerala tourism. As boatmen we had used our thatched-roof wooden “kettuvallams” [literally meaning “stitched boat,” a traditional country boat made with wooden planks, stitched together with coir ropes, steered only with a punting pole] to transport rice. Then we realised we could make much more money by taking people to tourist resorts and spice farms. On the whole, the tourist industry has helped boatmen. But I worry about the condition of the backwaters. Neither the tour operators or the government are paying much attention to its worsening quality. The backwaters suffer from pollution because water hyacinths are growing so rapidly that they have taken over the waterways in some parts. The clusters of these mauve flowers make for scenic photographs but in actuality the hyacinths are choking the water. Boatmen see how fast these plants grow from week to week, and how they disrupt the natural water flow. Once they cover the surface of the water, they block off the sunlight, and the fish and native plants below become starved of oxygen. When the plants decompose they add to the pollution and soon mosquitoes start breeding. That is the reason why there have been malaria outbreaks in some of the backwater areas. There is a simple and natural way to get rid of the water hyacinths without using any chemicals, and many boatmen know how. If we channel the sea water to enter the backwaters for a few months, the salt kills the hyacinths and keeps the water clean and weed-free for a long time. If only people in authority would listen to us, they could easily improve the situation. An even more serious pollution is created by the houseboat industry. The tourists come mostly for the backwater tours, so the boatmen have begun to build bigger and fancier boats. Look along the shores and you can see how many wooden hulls are being constructed this very moment. There are about 2,000 houseboat “kettuvallams” today, and some of them are floating palaces. All have living/dining rooms, kitchens, bathrooms and verandas. The kitchens use kerosene stoves for cooking, and there is a generator for electricity and an outboard motor that runs on diesel. The luxurious versions even have two storeys, air-conditioned bedrooms, conference rooms, flat screens and whirlpools. I’m all for attracting visitors to enjoy this natural beauty. Many of us have well-paid jobs because of the stream of visitors. Besides, I enjoy taking tourists on my boat, and many of them stay in touch with me from all over the world. I’ve kept all their letters and cards in this book, and I read them from time to time. I have a beautiful card from a young couple from France who were here on their honeymoon. But I have chosen to ply the simple traditional version of the “kettuvallam” with no outboard motor and no overnight accommodation. I tell tourists who choose this kind of boat that they leave smaller footprints on the natural environment. The tourism board is simply ignoring the environmental effect of the increasingly numerous and luxurious houseboats. The diesel from the outboard motors and the kerosene from the stoves leak into the water, and sometimes we can actually taste the kerosene in the “karimeen” [also known as pearlspot fish] that the fishermen catch here. The cooking water from the kitchens and shower and bathwater also end up as pollutants. Remember, the backwaters are not only here for the tourists. There are village people who live on the shores, and they use the polluted water for their cooking, cleaning and washing. The tour operators of the fancy houseboats make good money, but the people in the villages whose waters get polluted don’t see any of the profits. We know Kerala does not have many other industries that will bring us money to live well. So, yes, we want development and economic opportunity. Yes, we want to open up to tourism. But we need the kind of tourism that will not destroy the natural beauty of the backwaters that makes Kerala so attractive for travellers and for the people who have lived here all their lives.